An imbalance of keratinocyte-derived cytok-ines and dysregulations of cytokine/receptor interactions both capable of affecting melano-cyte activity and survival has been demonstrated in vitiligo epidermis. Melanogenic growth factors such as stem-cell factor (SCF) and endothelin (ET)-1, as well as inflammatory cytokines with anti-melanogenic properties, such as IL-1, IL-6, and tumor necrosis factor (TNF)-α, are implicated. The over-expression of TNF-α may facilitate the apoptosis of keratinocytes, leading to a decrease in the production of ET-1 and SCF, thus enhancing melanocyte disappearance. 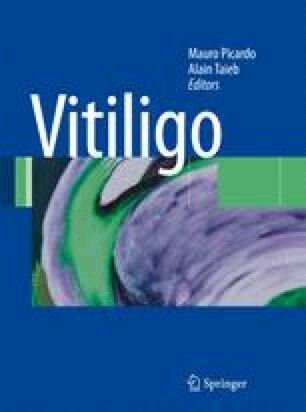 At the junction of lesional vitiligo epidermis, melanocytes remain and express tyrosinase, S100α and ET-B receptor (ETBR), but not c-kit or MITF-M.
At the center of lesional vitiligo epidermis, there is a complete loss of melanocytes expressing c-kit, S100α, ETBR, and/or tyrosinase. This deterioration in the expression of c-kit by melanocytes and its downstream effectors, including MITF-M, may be associated with the dysfunction and/or loss of melanocytes in vitiligo epidermis. The cytokine imbalance in vitiligo epidermis may be also related to an impaired keratinocyte senescence process.